Looking for an Express shirts fit guide or an Express size chart for shirts? This page contains shirt size data unique to this site and a review of Express shirts and the various fits available. You can purchase direct from Express by clicking on the image below. The fit guide below explains the four different fits of Express shirts available. Classic Fit shirt – this is the most generous Express cut, but it’s still relatively slim compared to other shirt brands. In late 2017 Express changed the names of their fits. This used to be called the Modern Fit. Athletic Fit shirt – Express describes this as broader through the chest and shoulders, with a tailored waist. I don’t have any measurement data for this fit as it wasn’t for sale in every one of the Manhattan Express stores I visited. When I visited the store on Broadway the sales assistant didn’t know that Express did an Athletic Fit! Slim Fit shirt – slimmer through the chest and shoulders with a slim waist. This used to be called the Fitted Fit. Extra Slim Fit shirt – the slimmest of the Express shirts, narrow through the chest and shoulders with the narrowest waist. This used to be called the Slim Fit. More detailed shirt sizing information is available below. This data is based on my measurements of actual Express shirts and is more detailed than on the Express website. One other thing to note, the Express 1MX shirts are made with 97% cotton and 3% spandex, which means they have more give in them than 100% cotton shirts. Shirts that fit like Express shirts? Looking for shirts that fit like Express shirts? See below. Shirts that fit like the Express Classic Fit include the Charles Tyrwhitt Slim Fit. Shirts that fit like the Express Slim Fit include the TM Lewin Fitted Fit. Shirts that fit like the Express Extra Slim Fit include the Charles Tyrwhitt Extra Slim Fit. Where are Express shirts made? 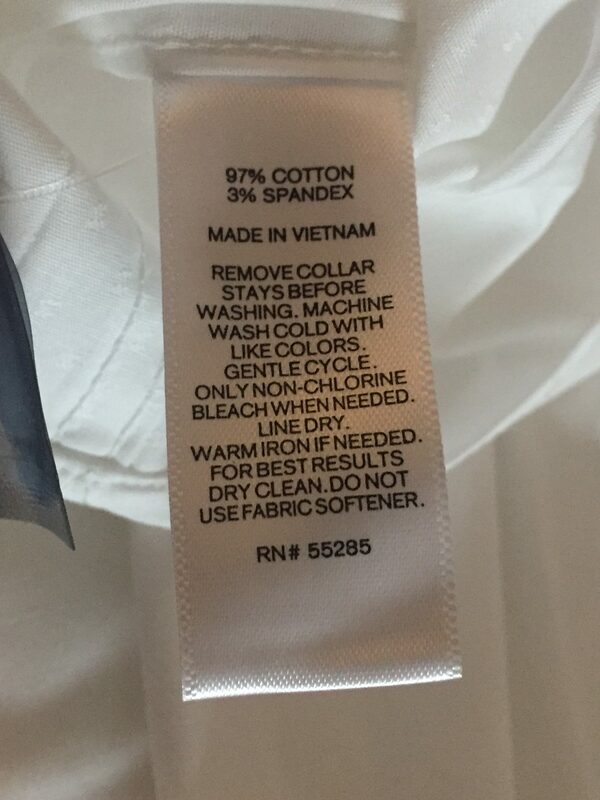 When I looked at the labels, Express 1MX shirts were made in Vietnam.